The liquid suddenly passing from high pressure to low pressure condition then produces a spontaneous evaporation without any external heat energy it is called “flash” or flash vapour. 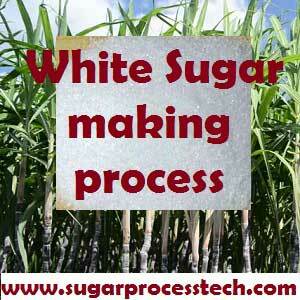 The flash vapour recovery is one of the important energy conservation system in all process industries. Simple we can say that flash pot is one of the energy conservation device. The flash pot having compartments with different pressures. The comportment connected to subsequent bodies of evaporator set. The high temperature water suddenly pass from high pressure compartment to lower pressure compartment. It thus produces a spontaneous evaporation or “flash”, which takes place almost explosively by reason of the physical incompatibility of the conditions of pressure and temperature. The quantity of water evaporated will correspond exactly to the quantity of heat given up. 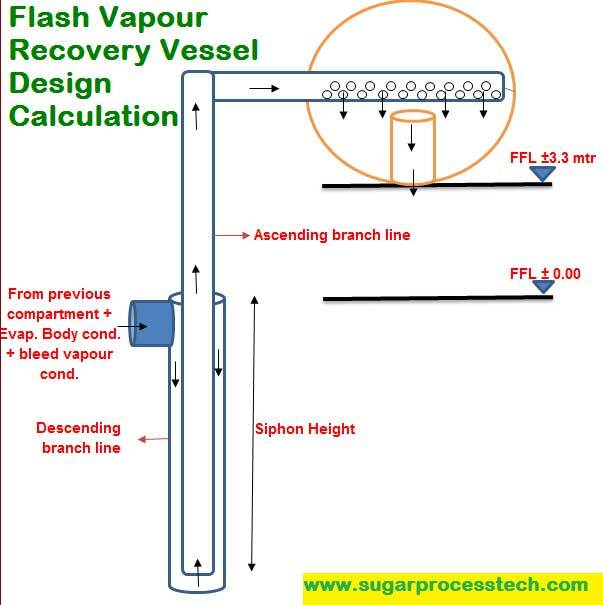 The main steps in the flash vapour recovery vessel system installation. Collection of the data. Find the absolute pressure of each compartment. Inlet and outlet water temperature with quantity for each compartment. 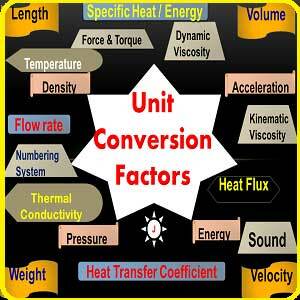 Calculate the flash vapour generation quantity in each compartment. Find the ascending and descending branch lines dia of each compartment. Calculate siphon height from one compartment to next compartment. Finally calculate compartment area required for the flash vapour and flash vapour line dia. Here consider flash vapour system designed for 5000TCD crushing capacity plant. The flash pot for 1st , 2nd & 3rd vapours of quintuple evaporator set. Generally, for 1st effect condensate purpose design separate flash pot or use PHE for heat recovery from that condensate water. Find the inlet water temperature with quantity of the each compartment. Formula for finding the evaporator body outlet condensate temperature. It is generally assumed that the condensates leaving a calendria are at the temperature of the vapour used in that calendria. Actually the condensates cool down slightly in running along the tubes, and their temperature may be given approximately. Tc= temperature of the condensates leaving the calendria. Tv = temperature of the vapour used for heating the calendria. Tj = temperature of the juice in the vessel. 5 th body vapour pressure = 0.17674 Kg/cm2 (630 mm of Hg). Condensate inlet Water quantity to the compartment (Q ) = 70 T/hr (As per the vapour bleeding calculation). Condensate inlet Water quantity to the compartment (Q ) = 70 + 63 = 133 T/hr (As per the vapour bleeding calculation). Condensate inlet Water quantity to the compartment (Q ) = 70+63+31 = 164 T/hr (As per the vapour bleeding calculation). Flash Vapour generation = Q x Cp x ΔT / λ =164 x 1 x ( 91.56 – 83.1) / 549 = 2.526 T/hr = 2.526 x 1000/3600 = 0.70166 kg/m3 = 0.70166 x 3.036 = 2.13 M3/sec. The required area for flashing depend upon the flash vapour velocity at the time of generation. The Souders – Brown equation is used for calculating the maximum vapour velocity. C = The value of the constant C is a measure of the droplet size that will be carried over and depends on the degree of separation of liquid and vapor required. 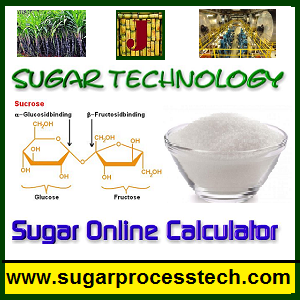 According to Cane sugar engineering by Peter Rein , coefficient C recommended 0.01 m/s. Flash pot is kept minimum 3 to 3.3mts from the common condensate pump for free removal of water and maintain NPSHa value for the pump. Suction and delivery lines of the common condensate pump to be equalize with lost compartment of the flash pot. ( equalizing connection to be take from the top of the compartment). 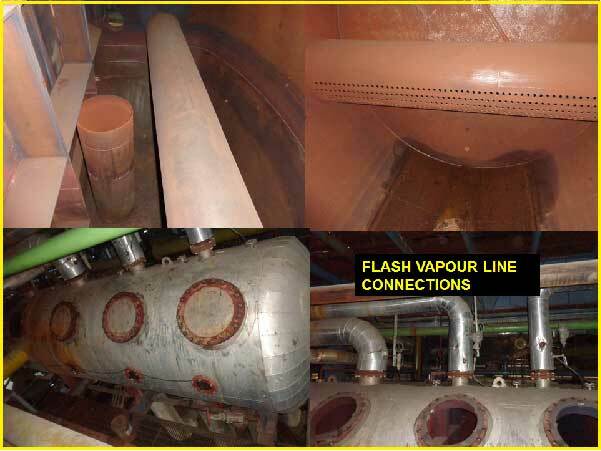 Pans and juice heater condensates to be connect descending branch lines of the flash pot as per the bleed vapour. The inlet water line provide center of the compartment and it is to be provide throughout length of the compartment. The opening of the water to the compartment from the perforated holes only. The perforated holes area to be provide 150% of the cross section area of the in water line. The perforated holes prove only bottom portion of the pipe line. The outlet water line elevation to be provide 100 to 200mm below the inlet line bottom level. Generally ascending line provides in the center of the descending line. So here Descending line cross sectional = Cross sectional area of center line ( ascending line) + Required cross section area of the water of the descending. Sight and light glasses to be provide in the middle of the each compartments in opposite direction. Economizer heating surface and Its Outlet Flue Gas Temperature Calculation in thermal power plants with online calculator. This website purely non commercial. All calculators providing in this website without any sale. Only motive of this website to educate the all technologist to share his knowledge. I shall require calculations for the condensate flash /sigar tank for 2500 TCD.sugar plant as working for quadruple set as both working with quintuple set . Read this article carefully. Definitely it will give the answer for your question. Plz give the one of the drawing of flash recovery system. Job to our entire technocrat community. Many many thanks to you.